We can offer a suitable policy to those who are finding it difficult to obtain home insurance for a variety of reasons. If your house is non-standard construction, or needs non-standard construction subsidence cover or if you have an underpinned property. Even if your property has been affected by Pyrite we can offer cover on your home whilst the remedial work is taking place. Once the work is completed we can offer full cover, we also offer cover for non-standard roofs and insurance for properties under construction. Have you Been Refused House Insurance? In the past if you have been declined, refused or had your insurance cancelled because of bankruptcy or other reasons, we can still offer you cover. Even if you have been refused home insurance because of a high value claim or had a conviction Quotedevil can offer you full home cover over the phone. Our QD nonstandard house insurance policy is designed for non-standard property risks. It is there for those of you finding it difficult to insure your home. Older properties and especially listed buildings have traditionally been very difficult to insure here in Ireland. Quotedevil are delighted to announce we now have a specialist home insurance product for buildings constructed pre 1900. This includes policies for listed buildings and protected structures including house insurance for Georgian & Victorian homes. When calculating the sum insured you should factor in the cost of a conservation architect and the cost of alternative accommodation. We have excellent rates for these types of premises, so if you live in a listed or protected home give us a call and we can save money on your premium while officering excellent cover to protect your property. Our High value home insurance policies have high policy limits and a host of special cover extensions. It is designed for people with contents valued at more than €75,000 and no upper limit. We have comprehensive cover and it has worldwide all risks cover with accidental damage for no extra cost Fine Art has automatic cover off €15000, our policy is perfect for properties built before 1900 that are also protected structures or listed buildings. The higher value contents policy can be outside of the appetite of a lot of insurers but we have a policy that is specifically for this. Is your home affected by Pyrite? Are you finding it very difficult to get home insurance cover at an affordable rate? Some insurers will not even quote on homes or properties that have been affected by Pyrite but Quote Devil is different. 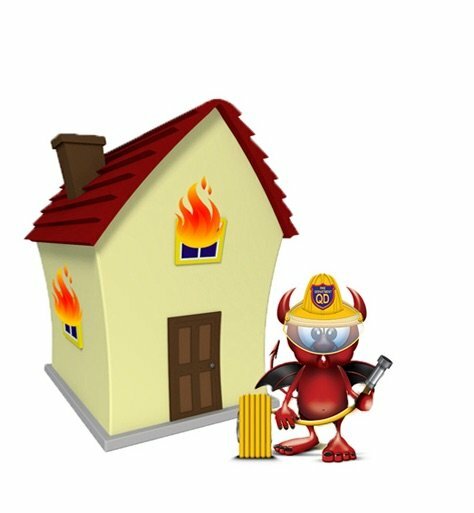 At Quote Devil we have a specialist insurer that can offer you cover for your home while any remedial work is being carried out. Then once the work is finished we can offer you full insurance cover on your property at an affordable premium. Please email us at houseinsurance@quotedevil.ie or call us on 01 254 1300 to find out more.